To make chilli and ginger dressing, heat oil in a small saucepan over low heat. Add ginger, eschalots and chilli, and cook, stirring, for 3 minutes or until soft. Stir in sugar and vinegar until sugar dissolves, then simmer for 5 minutes to mellow the vinegar taste. Add 2 tablespoons water and bring to the boil. Remove from the heat. Add soy sauce, fish sauce and lime juice, and stir to combine. Set aside to cool. To make salad, cut avocados into thin wedges. Slice cucumbers in half lengthwise, remove seeds and thinly slice on the diagonal. Place avocados, cucumbers, nuts, chives and lime juice in a large bowl and toss to combine. Place sesame and fennel seeds on a plate and season generously with freshly ground black pepper. Press a piece of tuna into seed mixture to coat. Turn over and coat the other side. Repeat with remaining tuna. Heat oil in a large frying pan over medium–high heat. 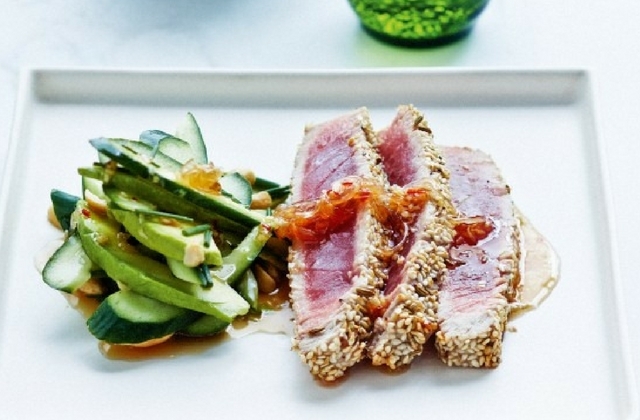 Cook tuna for 1 1/2 minutes each side for medium–rare or until cooked to your liking. Divide salad among plates. Drizzle with dressing. Slice tuna and place next to the salad. Drizzle with a little more dressing to serve.